Building on earlier research that found the number of people who fish has been steadily declining, a new study conducted by researchers at Michigan Technological University (MTU) and funded by the Great Lakes Fishery Commission (Commission), sought to evaluate the shifting demographics within the angling community and determine how the changing composition may impact fishery management decisions. Among the major findings is that female fishers make up a growing proportion of anglers in the Great Lakes region as younger generations of women are more likely to fish than were their mothers and grandmothers. The increasing number of female anglers in the younger angling community, however, is not sufficient to reverse the overall decline in anglers. Each year, approximately 1.8 million recreational anglers fish the Great Lakes. Millions more fish inland lakes and streams across the Upper Great Lakes region. Anglers play a critical role affecting the region’s fisheries, their related ecosystems, and fisheries management practices, and policies. Dr. Richelle Winkler, the principal investigator for the study, and PhD student Erin Burkett, examined changes to the angling population by looking at the recent trends in anglers through various demographical lenses such as gender, age, time period, and birth cohort. The researchers looked broadly at the total population of all anglers in the upper Great Lakes states (Illinois, Indiana, Michigan, Minnesota, and Wisconsin), as well as a subset of those anglers in who specifically fish salmon and trout in the Great Lakes. One of the key findings of this study was that while the stereotype that most of the people who fish are older (born before 1965) is true, the stereotype that fishing is a man’s sport, does not hold true in younger generations. On the contrary, the research found that in the younger angler community (those born after 1980), males are less likely to fish than their predecessors and females are more likely to fish than prior generations. The only exception to this finding is that in states that offer a spousal fishing license, older generation females (born in the late 1950s and 1960s) also show high participation rates, in correspondence with a male spouse. This means that as the current angling community grows older, and is increasingly replaced by newer generations, the number of male anglers is projected to decline and the number of female anglers is projected to remain stable or increase over the next fifteen years. It is important to note, however, that the increase in female anglers will not be sufficient to supplant the overall decline in anglers. In looking at salmon and trout anglers of the Upper Great Lakes, the study did not investigate differences in gender composition within this subset of the angling community, but did conclude there were analogous generational trends to the broader community in two of the three Great Lakes studied. Older generations of salmon and trout anglers were significantly more likely to participate than newer generations in both Lake Huron and Lake Michigan. In Lake Superior, however, there was no clear distinction between generations. 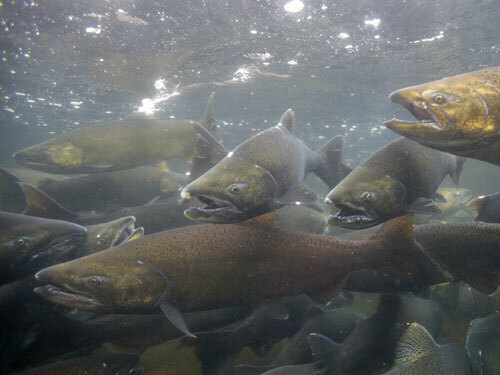 Looking towards the future, the salmon and trout angler populations are projected to decline in Lake Huron and Lake Michigan, while Lake Superior populations are expected to remain stable. This trend could be indicative of the quality of the fishery, which has declined in recent years due to decreasing alewife populations, or it may be more related to the past condition of the fishery whereby Lake Huron and Lake Michigan provided abundant salmon fishing opportunities at the time when the Baby Boomers came of age and started fishing. More information about this project, including reports and maps for each state and lake, as well as access to all demographic data collected as part of this study, can be found here: https://www.mtu.edu/greatlakes/fishery/index.html.